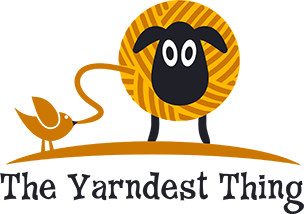 I wanted to spread the word of a lovely yarny friend of mine and knitting streamer of which whom I am a loyal viewer and fan. Her name is Jenny and she hosts a live knitting stream that you can access here on Twitch creative titled, JennyKnits. I personally think this platform is a brilliant way to allow yarn crafters to congregate & share in each other's love of knitting. In essence, it's an inter-webby knitting meetup, where you can meet and interact with others who share in your love of the craft, but from all different parts of the world rather than just locally. Pretty cool concept! I encourage you to stop in and say hello, or even lurk in the chatty shadows if that's your preference. (She welcomes viewers of all kinds, no judgments.) As you'll see, it's evident Jenny puts a lot of love and time into her knitting channel. She's super friendly, informative, entertaining, helpful and will leave you laughing out loud, dancing in your chair...most times both. Warning: She's full of ideas for some tasty eats too, so enter hungry at your own risk. Lol ;) She also has a collection of fantastic knit video resources for new and seasoned knitters alike. Tune in for lots of knitting, chit chat with fellow stitchers, crafty banter of all sorts, and most definitely prepare to share some laughs and smiles. Occasionally Jenny will even host some awesome giveaways! You can catch her live broadcasts currently Monday thru Friday from 3pm - 5pm EST. Spread the "K" word, bring your yarn and needles & tune in to JennyKnits on Twitch creative! I'll be sure to see you there with my balls & needles raring to go! Keep needling Jenny!